The Gold Bullion Company are an authorised Metalor Gold Bullion Distributor offering a range of premium Metalor branded Gold Bullion products. 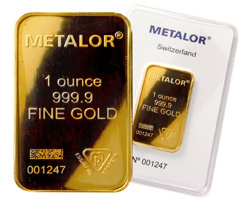 Founded over 160 years ago, Metalor has become one of the global leaders in the supply of precious metals, specifically gold. Originally the company specialised in the supply of gold to the jewellery and watch manufacture industry, before expanding the business to refining precious metals into bullion ingots. Today Metalor operates subsidiaries in 15 countries around the world from its headquarters in Switerland. Learn more about Metalor at www.metalor.com.